The Joint Revolutionary Council (JRC), which claims to be the highest organ of all the freedom fighting body, has released a statement asking the Nigerian Army to vacate the region or face full blown war. 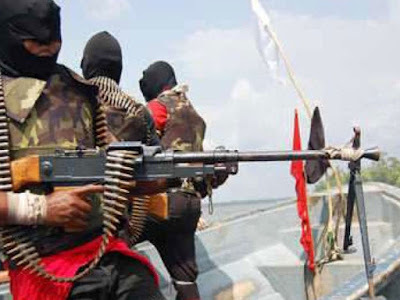 The military are in the region in search of members of the Niger Delta Avengers militants responsible for the various attacks on oil installations in recent times. The Joint Revolutionary Council (JRC) in its statement vowed to attack any helicopter or plane that flies in the region. The group in the statement also say they may attack the Commissioner of Information in Bayelsa state, Jonathan Obuebite, if he continues to make derogatory comments about the group. Read the full statement from the group below. 1. After extensive and exhaustive deliberation by all Commanders of various groups in Yenagoa, the heart of the Niger Delta struggle met last night and as part of our mission, we are going to test six (6) of our MISSILES in the region. This is to show the federal government of our readiness of the American prediction. 2. There should be NO any form of helicopter to fly around in the region as we will not guarantee the safety of such object. 3. The people of the Niger Delta region should not be panic in course of test running the 6 MISSILES. 4. We may also decide within the week to shut down the Nigerian satellite orbit, so that there will be no communication in the country if needs arise. 5. Within our three (3) days operations, NO airplane should fly out of the country because it can target such object no matter how small or big it may be. 6. Our Fighter Expert Team shall be position in the six (6) Niger Delta states, who are already arrived the region from training through our country’s porous borders with our foreign partners who are going to showcase what they have learnt in past on year. 7. Our struggle is not for any human blood, but we have been pushed to the wall for justice because our patience is running out on daily basis as Nigerian uniform men killing our innocent people continuously. 8. Nigerian military should as a matter of urgency leave peacefully the Ijaw communities they are presently in, the next 48 hours under the guise of searching for the Niger Delta Avengers (NDA) or else we should not be blamed of whatever catastrophe that may befall on such officers and the likely affected families of the officers should blame not the region. 9. We have consulted our war gods (deities) that enough is enough and that the time has come. Since the present Pharaoh of Nigeria, President Buhari is to preside over the disintegration of the country it is a good omen. 10. Henceforth, any attack on Ijaw communities or person(s) by the military or para-military body in the region, we will not hesitate to order our shoot-at-sight squad of any uniform personnel in the region. 11. We ask all Service Chiefs including Minister of Defence to shamefully resign their positions because Nigeria has no security in whatever form. Bravo to our Foreign Marine Crack Team for their ability to shut down Nigerian obsolete surveillance equipments. 12. For the records, Niger Delta Avengers (NDA) are not in Delta state, we only go there to strike and return back safely to the struggle base, Bayelsa state. 13. We further warn especially Mr. Jonathan Obuebite, Information Commissioner in Bayelsa state not to criticize our activities any longer or else he has a choice of leaving the planet earth anytime he made such statement(s). 14. All oil and gas operations should shut down immediately as our MISSILES testing will affect their equipments. 15. NOTE, we shall commence MISSILES testing on Tuesday 7, June 2016 which coincide with the date of our training abroad. Since the present Pharaoh of Nigeria (Buhari) fails to our demands. We promised Nigerians and the entire world that we are going to surprise them.